Children should be getting around an hour of exercise a day, and this counts for children with physical disabilities as well. Being fit can help with controlling weight, which can be an issue with children with limited movement, and also keeps heart and lungs healthy too, and may improve some of the symptoms of the disability, such as muscle control or breathing. Exercising as part of a group can also improve confidence and social skills. It has got easier for children with physical disabilities to gain access to sports and exercise. It is always important to check with a doctor before starting a new sport or exercise programme. It can be hard for parents of physically disabled children to let go enough to encourage the children to take part in sports and other exercise – the parents may be worried about the barriers their children will face and any disappointment they might feel if they can’t overcome them. They will be aware of the (sometimes hurtful) comments, stares and curiosity their children may arouse, and also have concerns about whether their children are physically capable of the challenges, and that they might get hurt or make their condition worse. Many sports clubs and fitness centres will offer options for children with disabilities – if they don’t, then suggest it – if enough people ask, the club or centre might respond to the demand and create a new group, perhaps for mixed physical abilities, or for a specialist group, such as wheelchair users. Self-help groups for parents and carers of children with particular disabilities can often offer help and advice, and may be able to suggest where to go or who to talk to, or suggest a type of sport that might offer a particular child the right kind of challenge. Phab Clubs get children and adults with and without physical disabilities mixing together, and provides a respite and a chance of socialising for families and carers as well. There are lots of different kinds of activities, including days out and outdoor adventure holidays. 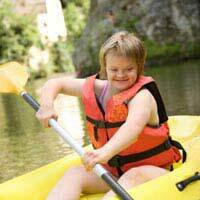 There are many kinds of sports that have been adapted for people with physical disabilities – racing, tennis, basketball, bowling, swimming, riding, sailing – even cycling, rafting, canoeing, skiing and rugby. Swimming can be a great activity, as it offers support to the whole body, and allows children that may find moving on land painful and awkward the opportunity to move more freely and easily, and often with less pain. Just keeping fit at home is possible too – there are exercise DVDs especially designed for people with physical disabilities, and many exercises on ordinary exercise DVDs can be adapted. This could involve the whole family, and actually get everyone fitter, as well as spending fun time together.